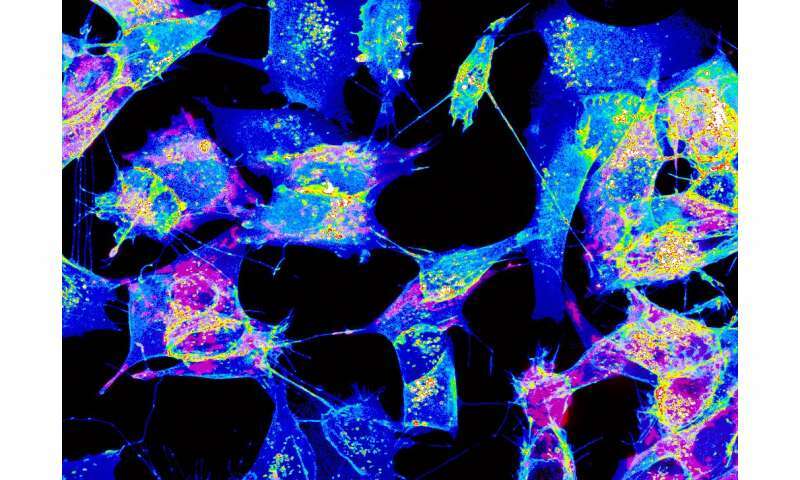 Cells communicate with one another much like humans do. This allows organs to work synchronously, which in turn enables them to perform a remarkable range of tasks. One such means of communication is via tunneling nanotubes (TNTs). In an article published in Nature Communications, researchers from the Institut Pasteur led by Chiara Zurzolo used advanced imaging techniques to study the structure of these nanotubes, and reports that the results challenge the very concept of a cell. As their name implies, TNTs are tiny tunnels that link two or more cells and allow the transport of a many types of cargo between them, including ions, viruses and entire organelles. Previous research by the same team found that TNTs are involved in the intercellular spread of pathogenic amyloid proteins involved in Alzheimer and Parkinson's diseases. This led researchers to propose that they serve as a major avenue for the spread of neurodegenerative diseases in the brain and therefore represent a novel therapeutic target to stop the progression of these incurable diseases. TNTs also appear to play a major role in cancer resistance to therapy. But as scientists still know very little about TNTs and how they relate or differ from other cellular protrusions such as filopodia, they decided to pursue their research to deal with these tiny tubular connections in depth. A better understanding of these tiny tubular connections is therefore required as TNTs might have tremendous implications in human health and disease. Addressing this issue has been very difficult due to the fragile and transitory nature of these structures, which do not survive classical microscopic techniques. In order to overcome these obstacles, the researchers combined various state-of-the-art electron microscopy approaches, and imaged TNTs at below-freezing temperatures. Using this imaging strategy, they were able to decipher the structure of TNTs in high detail. Specifically, they show that most TNTs—previously shown to be single connections—are, in fact, made up of multiple smaller, individual tunneling nanotubes (iTNTs). Their images also show the existence of thin wires that connect iTNTs, which could serve to increase their mechanical stability. They demonstrate the functionality of iTNTs by showing the transport of organelles using time-lapse imaging. Finally, the researchers employed a type of microscopy known as FIB-SEM to produce 3-D images with sufficient resolution to clearly identify that TNTs are open at both ends, and thus create continuity between two cells. "This discovery challenges the dogma of cells as individual units, showing that cells can open up to neighbors and exchange materials without a membrane barrier," explains Chiara Zurzolo. This work is an essential step toward understanding cell-to-cell communication via TNTs and lays the groundwork for investigations into their physiological functions and their role in the spread of pathogens, including viruses, bacteria and misfolded proteins.